Lolo was a pufferfish. For those who don´t know what a pufferfish is, they are fish that inflate like a balloon to show the spikes they have on their body to protect themselves when they perceive a threat. When Lolo sees sharks or other big fish around he uses this technique to automatically protect himself. 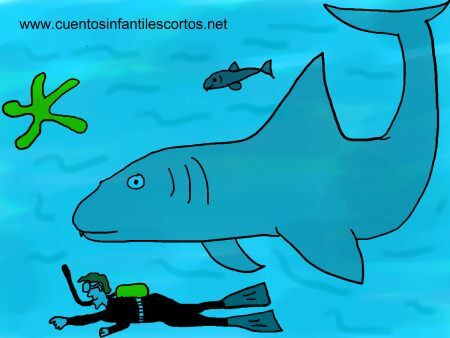 One day, Lolo saw a female shark and fell in love with her, but everytime she came near, Lolo tried to protect himself. Soon they started to talk to each other and Lolo began to trust her, and stopped using his protection mechanism when she was around. The days went by, and Lolo was happy thinking that the female shark also liked him, until one day, the shark ate him while he was sleeping.